Compared to a regular mouse, a gaming mouse offers tons of extra features. Most of the top gaming mice have comfortable, ergonomic shapes that aid in prolonged gaming sessions. Gaming mice also usually offer programmable buttons that can be customized through software. The main reason to get a modern gaming mouse, though, is that they offer accurate tracking and are responsive– thanks to the latest optical and laser sensors; both of which assists you while gaming. In this article, we’ll go over some of the best gaming mice under $50. Razer is among the best companies in the peripheral market. In particular, their products are well-known for having dazzling aesthetics thanks to Razer Chroma RGB lighting. As far as RGB goes, however, this is one of the more muted Razer products only having RGB around the logo and mouse wheel. These can be customized using Razer Synapse. 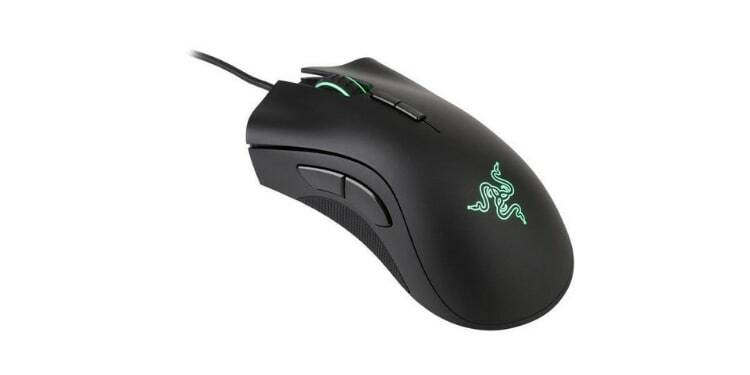 The Razer DeathAdder Elite may be considered a budget gaming mouse (it is under $50 after all) but it is widely used by professional esports gamers thanks to its tried and true shape and extremely accurate sensor. Despite its traditional look, it does have textured grips on both sides, which accomplish what they set out to do. Both the left and the right click buttons provide the same sound and offer smooth but tactile feedback. Razer uses their own mechanical switches which are, in fact, customized Omron switches, and are rated for 50M clicks. The mouse offers two big side buttons, which are easily accessible. The side buttons offer tactile feedback and feel really good, unlike some other mice which provide mushy feedback. All of the seven buttons are programmable and their functionality can be customized through the software. The scroll wheel keeps a great balance between smoothness and distinct steps and provides a textured surface for better grip. As far as the sensor is concerned, the mouse uses a customized optical sensor, with a 16,000 CPI and is considered one of the best optical sensors out there. Sadly, there isn’t any onboard memory, so you won’t be carrying around any custom profiles, as such we recommend this mouse to those who aren’t interested in LAN parties. However, if you are looking for great performance along with nice aesthetics then this mouse is definitely one of the best gaming mice under $50. SteelSeries is a master of peripherals with their mice being their most praised products. The SteelSeries Rival 310 is a high-end gaming mouse that is used by many professional esports gamers. The mouse offers an ergonomic shape with big textured silicon grips on both sides which give it a soft feel. 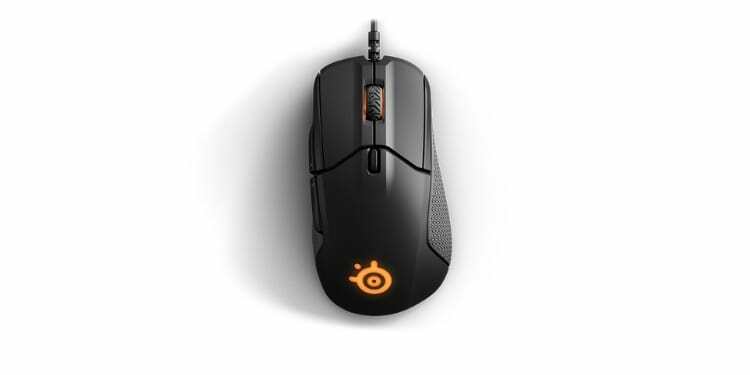 The SteelSeries logo on the back of the mouse and the scroll wheel are RGB-lit and the lighting can be customized through the SteelSeries software along with CPI and polling rate controls. The mouse has two side buttons, one CPI button behind the scroll wheel and the two main click buttons. The side buttons on this mouse are a tad longer than other mice making them easier to press, which is a small but much-appreciated detail. The scroll wheel uses the same silicon material as the sides of the mouse, which ensures your finger won’t slip while using it. The CPI button can be used to toggle CPI settings, but only between two settings… and there is no indicator for the current CPI, which is arguably the mouse’s biggest flaw. Honestly, it is sad that such a large oversite was allowed to dampen this mouse because TrueMove3 sensor is great. In fact, thanks to its 12,000 CPI limit, the mouse provides 1:1 tracking for up to 3,500 CPI. Thanks to its grip, light weight, and great sensor the Rival 310 is a great esports mouse… assuming it fits in your hand properly (it’s kind of small). 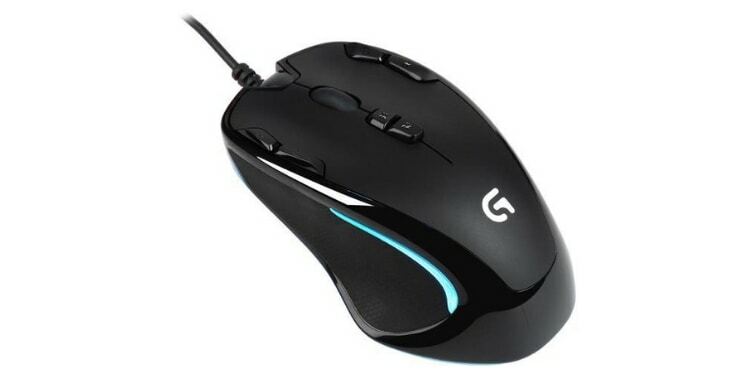 Logitech mice are famous for their wireless capabilities, which became possible due to their LIGHTSPEED technology. 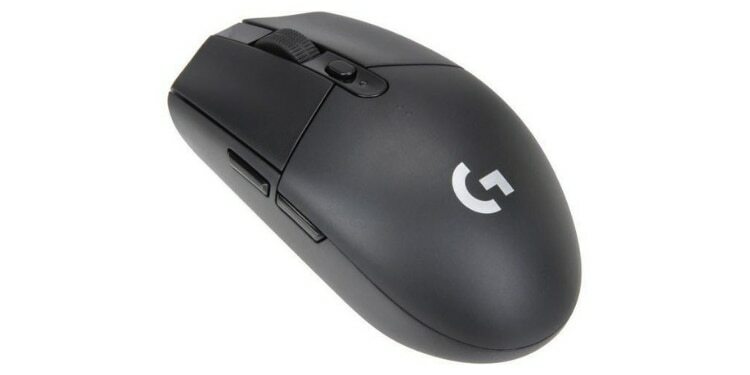 The Logitech G305 is one of their latest wireless mice and is quite similar to Logitech G-Pro in terms of shape, although it is a bit smaller. This mouse could’ve easily qualified as ambidextrous had it not been for the two side buttons on the left. Going by the body of the mouse, it technically is… just don’t expect to use those extra buttons as a left handed user. Either way, since the body doesn’t have any sort of rubber, if you’re a person with sweaty hands, then you might find it annoying. RGB is also lacking on this mouse, although there is a (non-RGB) Logitech logo on the back of the mouse. The mouse offers two slim side buttons. While they work well, they only actuate after a long travel distance. This could have been better if the actuation point was earlier while having a similar travel distance. As for the scroll wheel, the wheel offers hard texture on the top, which is irritable at first but offers smooth rotation, although it doesn’t have the Infinite Scroll feature that some of Logitech’s other mice, like the G302, do. The main clicks are only rated for 10M clicks and are quite loud. The mouse uses Logitech’s latest Hero sensor which is a big improvement in terms of efficiency when compared to the Logitech’s G203 sensor (Mercury). The performance of this sensor is more similar to the PixArt 3366, which our next mouse uses. The battery life is respectable. With one AA battery you can get around 250 hours. Logitech also claims it can last as long as nine months when using the mouse in Endurance mode. Speaking of batteries, while the mouse weighs around 99g, you can make it slightly lighter by using a Lithium-Ion battery. Overall, one cannot get a better wireless mouse at this price point (although we have gathered more wireless mice if that’s what you’re after). If the slim side buttons aren’t a deal breaker for you, then this can be your ultimate wireless companion. Honestly, this would have been a strange list without any Corsair products. Corsair is an enthusiast-class company and their mice are famous for their build quality and the Corsair M65 Pro RGB-- which targets FPS gamers-- is built like a tank. 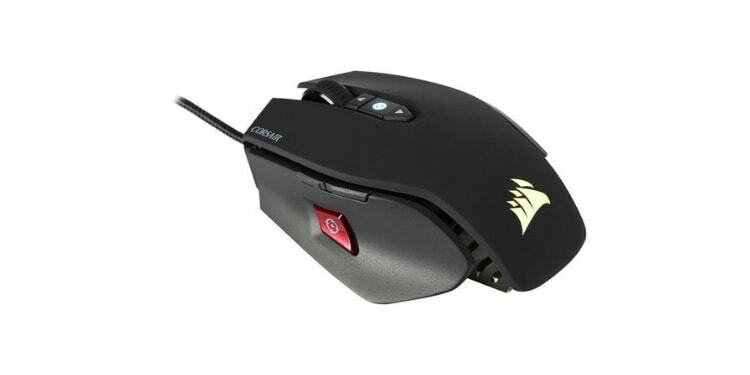 The top of the mouse offers a beautifully crafted scroll wheel and two up and down CPI buttons. The scroll wheel and the Corsair logo on the back are RGB-lit and support the Corsair iCue technology. There is also an RGB lighting spot between the CPI buttons which indicate the current CPI settings (it has 5 presets). The left side of the mouse offers two small side buttons along with the (in)famous Sniper button. The sniper button can be used to lower the CPI settings while zooming in with a sniper rifle, which is great. However, if you hold the side of your mouse with a lot of pressure, then you might find yourself accidentally hitting this button from time to time. The bottom also provides three additional weights. While the mouse is slightly on the larger side, it’s not particularly heavy. However, it might not be suitable for people with small hands or those who want to use the fingertip grip. The mouse uses the famous PixArt 3360 sensor which is a flawless sensor and we found no tracking issues. Overall, this is one of the best gaming mice for competitive FPS gaming. The Logitech G300s is one of the cheapest gaming mice out there but that doesn’t mean it’s short on quality. The mouse features a unique ambidextrous shape with lighting bars and grips on both sides. These bars aren’t RGB, sadly, but you can use the Logitech software to switch between 7 different colors. The Logitech logo on the top-- nor any other spot on the mouse, for that matter-- is not lit by any sort of lighting. The mouse does not feature any side buttons, instead opting to have them all on the top. There are two buttons on each side of the main clicks and two more below the scroll wheel for a total of six. Honestly, this layout is somewhat awkward. The two buttons below the scroll wheel require you to completely alter your grip. Meanwhile, the buttons that are in the same top corner as your dominant hand (top right for right handed people and top left for left handed people) are slightly awkward to hit since moving your fingers away from your body is less natural. The sensor used in this mouse is also the weakest on this list at only 2,500 CPI and offers slight jitter during lift-off but does not pose any other tracking issues. All of this being said, this is still a really good mouse for its price point. It should be reliable and while the buttons are somewhat awkward, six programmable buttons (outside of the scroll wheel and main clicks) is the most you will actually get on this list. Overall, we believe this is a good, cheap gaming mouse. A mouse is one of the most critical components of any gaming setup. While you may perform well without a good gaming keyboard, it is very difficult to perform well without a good gaming mouse. Since choosing a mouse is so important, we went ahead and put together the below guide to help you understand the ins and outs of gaming mice. The most important part of a mouse is its shape since it determines how you can hold it. You should also be aware of the grip style you usually use. Before buying your new gaming mouse, try to figure out the shape of the mouse. (There’s not any official nomenclature, you just sort of have to eyeball it.) For instance, it shouldn’t have any sharp corners which might cause discomfort during use. A lot of Chinese mice have very discomforting designs that look good aesthetically but are distressing in real world use. Palm Grip – Palm grippers rest their entire hand on the mouse. They should look for a larger mouse with a high back so that the whole palm properly fits the mouse. Claw Grip – The claw grip is similar to the palm grip, except you arch your fingers to click the buttons. Claw-grip users should look for a mouse with less back, but still enough to support the back of the palm. Fingertip Grip – With the fingertip grip, your hand hovers over the mouse and only makes contact with the tips of your fingers. Smaller mice– both length and width wise– are better for this grip as it gives you more control; larger mice will force your palm to make contact to comfortably use the mouse buttons. The mouse’s sensor plays an important role in its performance since it is directly responsible for tracking. If there are issues with the sensor, you’ll have a hard time aiming (or doing much of anything, really). The CPI/DPI is an important mouse specification. CPI stands for counts per inch and indicates the number of increments to the cursor per inch (DPI is often used interchangeably although they aren’t exactly the same thing). Therefore, higher CPI leads to increased sensitivity and faster mouse movement in general. But often, people (mistakenly) think a higher CPI makes for a great mouse. Higher CPI doesn’t improve the whole integrity of a mouse, it just means you’ll have more pronounced cursor movement. Some flawed mice sensors even jitter at higher CPI. However, CPI still plays a role, like when you need to quickly 180 degree turn to eliminate shoot your opponent. You should also do some research to make sure that the particular sensor being used by the mouse you’re looking at does not have known issues with tracking, especially during lift-off or acceleration. Gaming mice come with all sorts of unique button arrangements and additions. You will always have the right and left click as well as a scroll wheel, but aside from that it’s kind of random. CPI buttons, which can adjust how sensitive your mouse is, are pretty common. Some just toggle between two modes, like the SteelSeries Rival 310, while others cycle through multiple different presets, like the Corsair M65 Pro. At least two side buttons is pretty common, but some go up to 12 or more side buttons (not on this list). Others, like the G300s place the buttons on top. Then you get unique side buttons, like the M65 Pro’s “Sniper” button. While side buttons are common offers many additional buttons, which greatly aid in a lot of games and the layout of these buttons play an important role in their usability. Therefore, always look for a mouse with buttons which are easily accessible. Hassam has been around computer hardware since his childhood. PC Hardware is his passion. Tinkering and repairing PC parts is his side hobby while suggesting the best tech has become his main hobby and profession!